My brain works in funny ways. Adult ADHD perhaps. I’ve been fooling around with marquetry for maybe two months, since I finished building a Marquetry Chevalet, which I had to build after taking a marquetry class at the American School of French Marquetry. That in itself was supposed to be a lark, a fun thing to do to distract myself from work pressures. Little did I know I’d get sucked in and end up tooling up to make jigsaw puzzles out of paper thin wood. OK, to be fair, everyone who knows me would have made that prediction. So I’ve done a few practice marquetry projects, and I want to do a simple vanilla woodworking build to loosen up. Maybe build a small tool chest? In fact, A Dutch chest would be a reasonable project. Not too big of an undertaking. But wait, I need to incorporate some marquetry into it right? 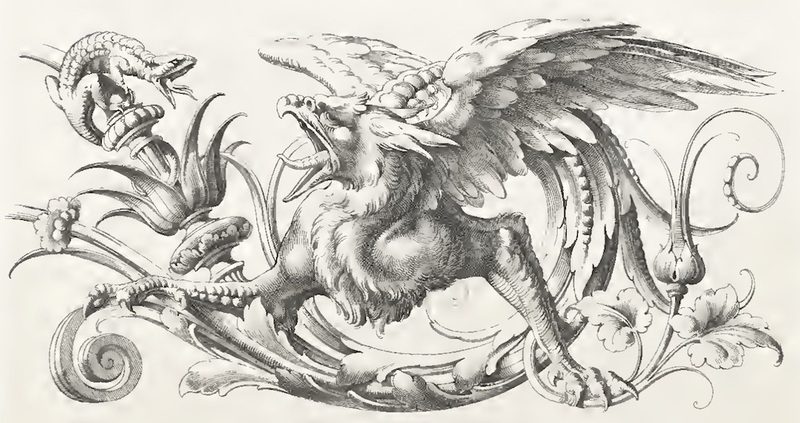 How about a Griffin attacking a Lizard, surrounded by scrolls for a tool chest? Yeaaaah, that’ll work. Maybe. We’ll see. But first I need to build the carcase. But before I do that I should probably knock out that Moxon vise I’ve been planning. I know I can cut dovetails on a wide board without it, but I want one. This should be a simple thing, even for me. (Fingers crossed). 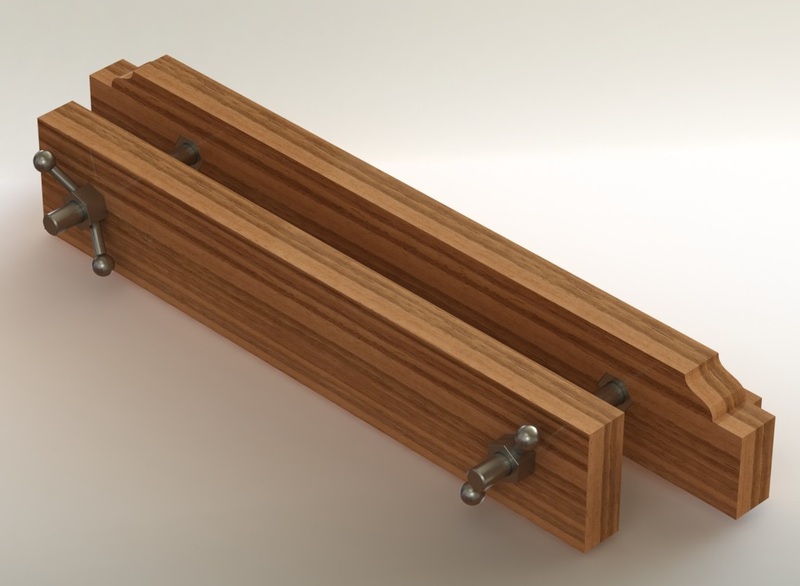 A couple of bits of threaded rod, nuts, wood. I found some 1″-5tpi Acme rod and nuts on eBay to get started. It was fairly inexpensive, about $60 plus shipping for 36″ of rod and six nuts. It’s awesome stuff, beautifully smooth threads. 1″ Acme thread, this is really nice smooth running stuff. Then wood. I have some 8/4 Eastern Walnut that should be good for this. If I can would around the knot and waney edges. Then I need a plan. Two boards, two holes in each. Easy Peasy. Well, maybe I should draw up some simple plans. This should be good. I can clamp up to 24″ wide boards in this, and I allowed for 4″ of clamping width – which should be more than enough. Maybe too much, the tradeoff is the screws stick out on the front of the vise. I’ll have to see what it looks like in real life. I milled up the lumber from rough stock this afternoon, and should be able to build the wood part tomorrow. I need my welder to make the handles, and it’s DOA – but parts are on order and I’ll have it up next week I expect. That’s going to be one pretty looking Moxon! Waiting to see the gryphon/lizard fight on the toolbox. Joe, I’d be interested to learn why your design places the brace above the lower edge of the rear jaw. It will preclude additional vertical registration of the workpiece down the width of the bench’s apron, which, personally, I find provides added stability under load. The brace is flush with the bottom of the rear jaw, the front jaw hangs down a 1/4″ lower to register with the front edge of the bench. Maybe you’re seeing an optical illusion or I have something misleading in the drawings. Optical illusion in the first photo mockup….created by the difference in length between the rear jaw and the brace. My bad. After this build, you will wonder how you ever got along without it. I’ve found some of the features like the top shelf very useful. I was torn between a top shelf or not. It would be useful for helping support the tail board when transferring the layout but I want to keep this simpler. I considered making it a bench-on-bench, and considered adding an alignment feature to line up both boards as David Barron does. I love the griffin, cant wait to see that! Why not let the excess rod stick out the back, that’s how I made mine. Weld the handled nuts to the end of the rod, and drill through holes in the front jaw. Embed a nut in the rear jaw, and Bob’s your Uncle. Consider puting a slight camber on the front jaw, it helps with clamping narrow stuff. The vise doesn’t open and close as easily, because there’s a lot more friction on the handle plus rod than on the handle by itself. You need to replace a lot more hardware if you decide you need different handles (something similar to a Benchcrafted wheel, for example). I’ve replaced the handles on mine twice. You need a welder (but everyone in Alaska has one, right?). OTOH, there may be a disadvantage to a freewheeling handle: You need to provide access with a wrench to the nut that is behind the rear jaw so you can adjust the maximum opening for your current project. If your vise doesn’t have a rear platform, or if you don’t mind flipping the vise over to make the adjustment, it’s not a problem. You should practice that griffin/lizard thing before you ruin a perfectly good toolbox. Put it on this Moxon vice, first! 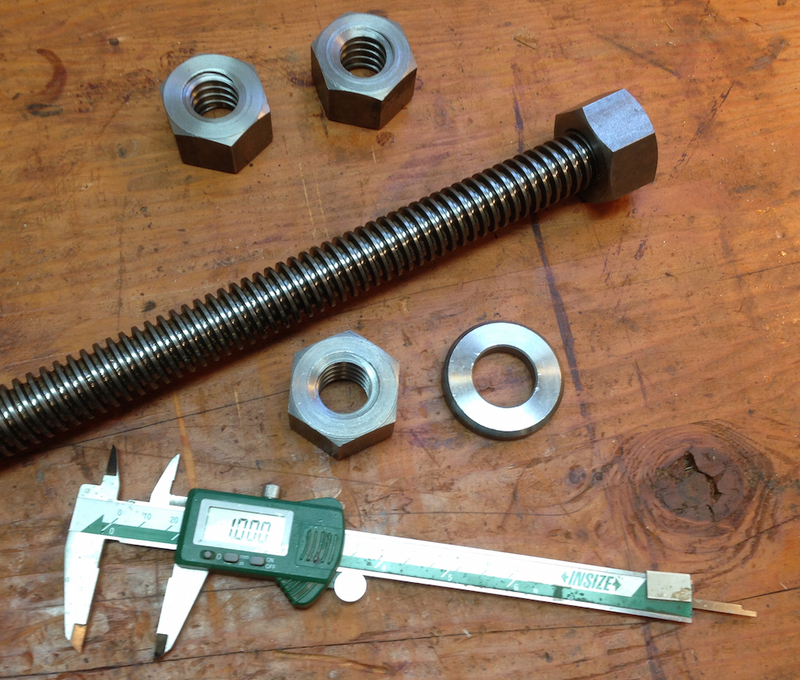 ENCO (www.use-enco.com) has 3/4-6 Acme nuts and threaded rod on sale through April 30. They’re on page 57 of their current Hot Deals catalog, for less than $30 for enough for a Moxon vise, items KW407-2206 and KW408-0206. I am using 1″-5 rod — I wanted the extra “beef”. Enco has this on sale for $20 for the rod, and $4 each for the nuts. That’s about 30% less than I paid, and I thought I got a pretty good deal (about $30 for the rod and $6 each for the nuts). I suggested using 3/4″ because all my dog holes, and my favorite Forstner bit are 3/4″, and also because i’m currently using cheap 3/4-10 UNC threaded rod from the home center instead of the much preferred Acme thread, and it will be easier to upgrade. If someone else wants to go the way I went, note that the ACME nuts are larger than the NC nuts, and you’ll need to rechop the mortise in the front of the rear jaw when you upgrade.